So many posts on traveling with kids only focus on the getting there part. 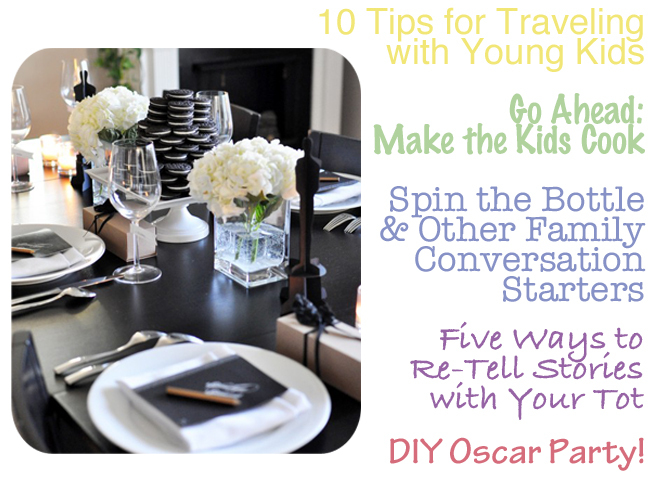 10 Tips for Traveling with Young Kids has some great advice on how to keep the littles happy once you’ve arrived. Parental Fantasy: Children Cooking Dinner – Makes you consider how savvy you want your kids to be in the kitchen, and how to get them there. Playing games like spin the bottle: family style is a smart way to get your children in the habit of opening up to you. Tired of reading the same story over and over? Try these 5 Ways to Retell a Story with Your Preschooler or Toddler. They’ll help broaden your child’s mind while keeping you from loosing yours. Wanna throw the best Oscar party on the block this year? Check it this amazing DIY, complete with a slew of free printables. I can’t decide which part is my favorite, the guest ballots or the oreo cake.